Geoff Diego Litherland is a Mexican born artist based in Nottingham. In 2012 he completed an MFA in Fine Art at Goldsmiths University of London. Recognition to date includes featuring in the Bonhams auction A Contemporary Edge in 2014, being selected for the 2013 Catlin Guide; in 2012 he won the Saatchi Online Surreal Showdown and the prestigious Warden’s Purchase prize from Goldsmiths. 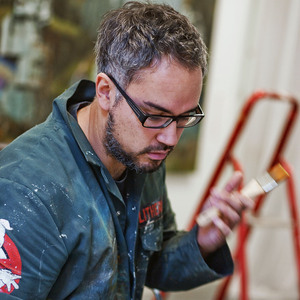 He has also been selected for the John Moores 25 Painting prize at the Walker Gallery in Liverpool and won the Nottingham Castle Open in 2008; his work is featured in public and private collections worldwide. Geoff is currently an associate lecturer on the Fine Art course at Nottingham Trent University. Geoff’s work explores the tension between the natural world and its grasping appropriation by human influence. It draws from traditional genres of painting together with the rusty surrealism of science fiction and the fantasia of abstraction to create parallel worlds that seek to not only question our perception of and relationship to nature, but paintings’ historical and current role in that.